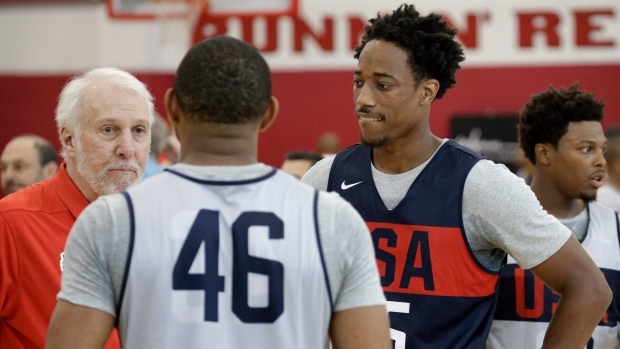 LAS VEGAS – Wearing blue and with Kyle Lowry dressed in white, DeMar DeRozan got his first taste of playing against his long-time and now former teammate early on at USA Basketball’s two-day minicamp. In one half-court scrimmage, with 25 of the NBA’s best American players split up into four teams, Lowry got the ball on the right corner and threw it directly into DeRozan’s hands on the wing, as he’s done so many times over the last six years – a force of habit, only this time it was a turnover. Seeing the two all-star guards in different coloured jerseys will take some getting used to, for us and apparently for them as well. “I think he just got scared when he saw me over there, and turned it over,” DeRozan joked shortly after Friday’s practice wrapped up at the UNLV campus gym. DeRozan arrived in Las Vegas on Wednesday and spent the bulk of the evening catching up with Lowry, a much-needed reunion on the heels of an emotional week for the 28-year-old shooting guard. Lowry was the first person DeRozan called when he found out he had been traded to San Antonio as part of the four-player deal that sent Kawhi Leonard to Toronto last Wednesday morning. This was their first opportunity to speak face-to-face, with DeRozan coming from Los Angeles and Lowry from his home in Philadelphia. Their friendship was never contrived or put on for the cameras, although their playful back and forth has always made for good television. It’s as strong as ever, even after having their home offices separated by over 2,300 kilometres for this coming season. However, that’s just about the only high-profile relationship that remains intact following a ruthless summer of business for the Toronto Raptors. DeRozan hasn’t spoken to Masai Ujiri since the Raptors president called him from Africa to break the news last week, and says he doesn’t intend to again, harsh as that may seem. When referencing Ujiri in a nearly 25-minute tell-all interview with ESPN on Tuesday, and then again after Thursday’s USA Basketball practice, DeRozan stayed clear of using his name. It’s clear DeRozan believes he was misled in the weeks that led to the trade. After everything he and the franchise have meant to each other over their nine seasons together, DeRozan expected some kind of heads up before being moved. Instead, he insists he was made to feel like it was business as usual, that he was, as he put it, “completely caught off guard”. One month after being fired, Dwane Casey accepted his NBA Coach of the Year award, seemingly thanking and shouting out anybody he could think of, with one notable exception: the man that signed him to his last contract extension. He and Ujiri still haven’t spoken and, according to sources, Casey is still harbouring plenty of resentment towards his former boss. How does Lowry feel about all this? We don’t know. He hasn’t spoken publicly since the firing of Casey, the promotion of new head coach Nick Nurse, or the trade of his good friend. The Raptors’ point guard declined to speak with the media following USA Basketball practice on Thursday, indicating that he’ll do so after Friday’s session. What he says, or how much he has to say, remains to be seen. What can we read into his silence? Is he sending a message of some kind? Maybe. Is he just being difficult? Perhaps – Lowry’s been known to be difficult. Or maybe, like DeRozan, his world has been shaken up and he’s still figuring out how to process it. This is what’s become of the Raptors’ happy family. After years of preaching continuity, loyalty and trust, they’ll have to find a new marketing campaign for the 2018-19 campaign. They’ve turned the page, and while it might feel like they’re committing some cardinal sin by doing so, there’s nothing that unusual about how they’ve conducted their work. As for the casualties of it – the hurt feelings and damaged relationships – those were mostly unavoidable. Business can be brutal, and this business can be especially so. There’s no easy way to tell somebody that their services are no longer wanted. That’s the reality of being a leader. You have to be willing to bite the bullet, and Ujiri has. He was clearly conflicted when he spoke to the media last Friday, probably more so than we’ve ever seen him before – torn between the business and the human side of his job. In a perfect world those two sides of the coin are one and the same, and they had been for Ujiri these past few years. The Raptors have won more than ever before, they’ve made more money than ever before, and they were doing it without having to rock the boat. It was nice while it lasted, and allowed Ujiri to keep his reputation squeaky clean – more or less – but that rarely lasts in the NBA. He’s made a few enemies along the way. Lou Williams doesn’t have the nicest things to say about Ujiri and the Raptors after his Sixth Man of the Year-winning season didn’t even earn him an offer from Toronto the following summer. While it’s still unclear what DeMarre Carroll’s gripe was on his way out, he’s not entirely thrilled about how his brief Raptors tenure ended either. Put it this way, even when things are going well there are always going to be tough decisions to be made, and there are always going to be people on the wrong side of those decisions. Still, when you’ve ticked off a role player it goes largely unnoticed. When the best coach and arguably the greatest player in franchise history can’t bring themselves to speak your name, it’s front-page material. Ujiri isn’t the bad guy, not any more or any less than he was before. If he managed to convince grown men that the Raptors were about family and continuity more than winning and the profit that comes with it, he’s one hell of a salesman. Like any and every other NBA team, their top priority has always been to win. That shouldn’t come as a surprise to anybody. Technically, Ujiri was not obligated to keep DeRozan in the loop. Could he have? Sure. Should he have? You can make that argument. However, there’s another side to this. The Raptors are one of the NBA’s biggest close-to-the-chest organizations when it comes to trades, free agent signings, the draft or injuries, and that’s been the case since Ujiri took over in 2013. They’re a vault, or at least they aim to be. It isn’t just that they don’t leak to the media, they tend not to over-share with players or agents, understanding that’s how the major news breakers get most of their info. Had Ujiri kept DeRozan and his agent, Aaron Goodwin, up to date on his dealings they would have had very little incentive to keep it to themselves, increasing the risk of tipping off other teams before completing the deal, and with other teams in the mix for Leonard that was a very real concern. Then, if the deal fell through – as most discussed trades do – you’ve got a disgruntled star coming back to Toronto knowing just how close he was to getting shipped elsewhere. In the end, this doesn’t appear to be the ‘he said, she said’ scenario it seemed like initially. DeRozan believes it should have been handled differently, and – whether he means it or not – Ujiri admits he should have handled it differently, and has since apologized for that. Ujiri felt it was time for a change. You can disagree with that assessment, but it’s his prerogative, it’s his team. “I gave them a chance,” he said last week, which was a poor choice of words and clearly not something DeRozan appreciated, but it’s true. They had their chances to prove what they could do, how good they could be together - more than most teams do, in fact - but fell short of expectations one too many times. So, they’ll try something new. However Ujiri went about ushering in that change was ultimately going to breed some amount of contempt. That’s just the way it is. There doesn’t always have to be a hero and a villain. Ujiri was doing his job, which is completely understandable, and DeRozan got hurt in the process, which is completely understandable. Regardless of how you feel about him as a player, or whether you agree with the stance he is taking here, DeRozan is entitled to feel what he feels and take as much time as he needs to come to terms with how his Raptors career came to an end. He’s an emotional person and he makes no attempt to hide it, which is what sets him apart from most professionals. Time heals all wounds, as they say. The relationship between DeRozan and Ujiri will probably never be what it was, and it certainly won’t ever be what his and Lowry’s relationship still is. But he’ll get over this, and so will the Raptors. Change is hard, but nothing lasts forever.